Brief Synopsis: The heroes unite for a last stand against the Black Lantern Corp. Booster Gold and Skeets join the assembled colored lantern corps in battle against the Black Lantern Corps of Nekron in Coast City. 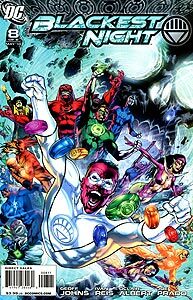 Heroes and villains identifiable include the heroes of Earth (Atom Smasher, Beast Boy, Black Canary, Cyborg, Dove, Fire, Flash I, Flash III, Green Lantern I, Mr. Terrific, Power Girl, Robotman, Starfire, Uncle Sam, Wonder Girl), Black Lantern Corps (Animal Man, Aquaman, Black Hand, Chay-Ara, Donna Troy, Evil Star, Firestorm VII, Green Arrow, Hawk, Hawkgirl, Hawman, Ice, Khufu, Kultonius, Martian Manhunter, Maxwell Lord, Nekron, Qull, Qurr, Superman, Wonder Woman, Worz), Blue Lantern Corps (Brother Hynn, Brother Warth, Flash II, Ganthet, Saint Walker, Sayd), Green Lantern Corps (Arisia, Graf Toran, Guy Gardner, Hannu, John Stewart, Killowog, Morro, Kyle Rayner, Soranik Natu, Stel, Tomar-Tu), Indigo Lantern Corps (Atom II, Indgio-1, Munk), Orange Lantern Larfleeze, Red Lantern Corps (Atrocitus, Bleez, Mera, Ratchet, Skallox, Zilius Zox), Sinestro Corps (Akrillo, Bedovan, Karu-Sil, Kayb, Maash, Murr the Melting Man, Romat Ru, Slushh, Tekik), and Star Sapphire Corps (Carol Ferris, Fatality, Miri Riam, Race). 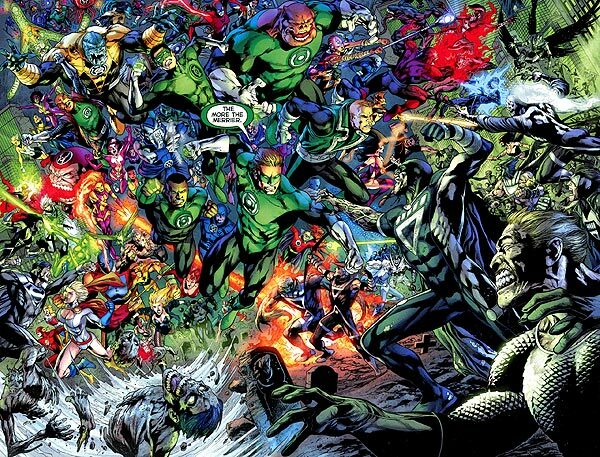 This battle is titanic, including nearly 100 identifiable characters, the largest collection of super-powered individuals that Booster Gold has appeared with on-panel up to this point in his career. This surpasses the previous on-panel high, fittingly another Green Lantern-related event, the funeral of Hal Jordan in Green Lantern, Volume 3, #81. This is also Booster's first meeting with a majority of these characters. Booster Gold is seen in the background amidst the chaos beside S.T.R.I.P.E. fighting some indistinct Black Lanterns. Also present during the battle but off panel are the Anti-Monitor, Blue Devil, Captain Marvel, Kid Flash, Metamorpho, Sister Sercy, and Superboy. As the dust settles on the battle's aftermath, Booster gold joins the survivors, including Jason Rusch, Steel, and Tri-Eye. Also present but off panel are Deadman, Dr. Mid-Night, Stargirl, and Supergirl. Booster is a mute witness to the confrontation between the assembled leaders of the colored lantern corps, including the Guardians of the Universe and their old foe Sinestro, over the fate of Lex Luthor. This is Booster Gold's last appearance in this issue. You all are more kind than I, but I did spend my money on it. I will happy acknowledge Boosterrific's "rightness" about BN. The story ended with a whimper and not a bang. While Blackest Night was not a commercial failure by any means, I think the saga dragged and was often incoherent.